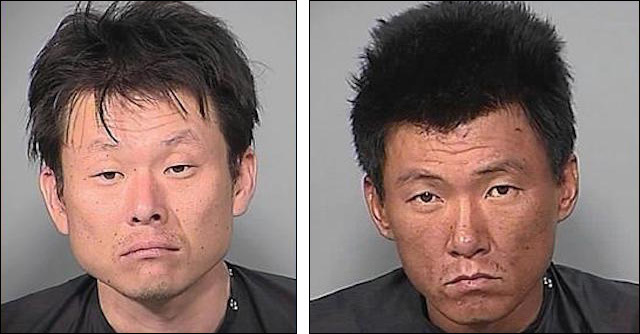 Jae Shim and Steve Kwon killed five people with a baseball bat and samurai sword in 2008. Last week in Southern California, a man was sentenced to life in prison without parole and a second man was sentenced to 125 years to life for murdering five people with a baseball bat and samurai sword in 2008. 46-year-old Jae Shim and 45-year-old Steve Kwon will likely spend the rest of their lives in prison for the "hideous" murders of five people, including two children and a NASA scientist. Shim was sentenced to life in prison without the possibility of parole, while Kwon was given 125 years to life. Shim and Kwon were convicted of the 2008 killings of Shim's ex-wife, 34-year-old Jenny Young Park; her boyfriend, 34-year-old Si Young Yoon; her daughter, 13-year-old Jamie; her son, 11-year-old Justin; and 60-year-old Joseph Ciganek, who was married to Park's cousin. "These crimes were hideous ... They were brutal beyond belief,'' Los Angeles Superior Court Judge Larry Paul Fidler said in court today before their sentencing. Kwon and Shim each pleaded guilty to the June 23, 2008 killing rampage earlier this year. The victims of the disturbing slayings were Shim's 34-year-old ex-wife, Jenny Young Park; her boyfriend, 34-year-old Si Young Yoon; her 13-year-old daughter Jamie; her 11-year-old son Justin; and her cousin's husband, 60-year-old NASA engineer, Joseph Ciganek. Prosecutors said Kwon bludgeoned the victims with a baseball bat in Ciganek's home in Quartz Hill, a city just southwest of Lancaster, and then Shim finished them off with a samurai sword. They then set Park and her two children on fire. Yoon's body was dumped in Mexico. Shim pleaded guilty to the murders and arson in February, and admitted to the special circumstance allegations of murder while lying in wait. He then agreed to testify against Kwon so that he could avoid the death penalty, according to the AP. Kwon would plead guilty to the murders and arson in July. Shim had been in a custody battle with Park, and was apparently angered by the fact that she and Yoon had recently become engaged. According to prosecutors, he enlisted Kwon's help to murder them, and planned to frame Yoon for the killings. However, they unintentionally left the sword and bat behind. Turns out, they're not only terrible, homicidal human beings, they're also dumbasses.